Info: Following Tsering Tashi’s self-immolation in the main street of Amchok township on January 12, Chinese police and Public Security Bureau officials arrived in several vehicles. They barred the monks of Amchok monastery and local lay Tibetans from offering prayers and ordered Tsering Tashi’s family members to cremate the body as soon as possible. When the family initially said that they needed to perform the customary religious rituals for a death, they were threatened and told that they would be responsible for the consequences if they refused. Tsering Tashi was married to Yumtso Kyi and is survived by his wife, parents and two sisters. He was described by Tibetans who knew him as “good-natured and polite” with a keen passion for horses and horse racing. 22 yrs old, who self-immolated in Amchok, Amdo, Tibet on January 12, 2013. 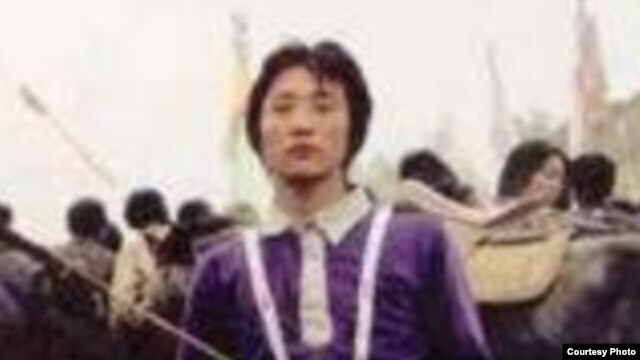 In the morning before his self-immolation, he said ' I think I am wearing a chuba (Tibetan traditional dress) today. He, the gentle and quiet-natured man, then put on the thick chuba and carried out his fiery protest. Local Chinese police restricted people from visiting his home to offer prayers. They surrounded his home and the entrance of his villege with their cars search-light on like watch dogs. Tibetan self-immolator Tsering Tashi in an undated photo. DHARAMSHALA, January 14: Tibetan self-immolator Tsering Tashi’s body was forcibly cremated late Sunday night near his home town in Amchok after repeated threats and mounting pressure from local Chinese authorities. 22-year-old Tsering Tashi passed away in his self-immolation protest on January 12 in Amchok town in Sangchu region of eastern Tibet. According to eyewitnesses, he shouted “Gyalwang Tenzin Gyatso” as he marched on the street engulfed in flames before succumbing to his injuries. Although Chinese security personnel arrived at the scene but local Tibetans were able to rescue his body following a minor scuffle. Tsering Tashi’s body was then carried to his home in Kyi village of Amchok where monks and nearby Tibetans gathered to pay their last respects and offer prayers despite strict governmental orders against show of sympathy with self-immolators or their families. According to US based Tibetan journalist Tsering Kyi, who is a close relative of the deceased, local Chinese police and Public Security Bureau officials soon arrived in several vehicles and surrounded the entire area. The officials barred the monks of Amchok Monastery and local Tibetans from offering prayers and ordered the deceased’s family members to cremate the body as soon as possible. However, when the family members refused to cremate the body before performing the customary Tibetan rituals, the Chinese authorities threatened them saying that they will be responsible for all the consequences and sent for a local Tibetan lama who also advised them to follow the orders. The local Public Security Bureau head further blamed Tsering Tashi’s family members of having “close ties with the splittist Dalai group” and banged his fist on the table. According to the same source, the deceased’s father Dugkar Kyab, agreed to cremate his only son’s body considering the imminent threat to the livelihood and security of the people of the village. Tsering Tashi’s body was cremated late Sunday night, January 13, when most people were fast asleep. Chinese authorities allowed only a few people to attend the cremation. The deceased’s mother Tsering Dolma, when she heard of the orders by the Chinese authorities, she fainted and had to be rushed to the hospital. Tsering Tashi is survived by his parents and wife Yumtso Kyi. On the day of his self-immolation protest Tsering Tashi wore full Tibetan traditional attire and had wound his body with wire before setting himself on fire. 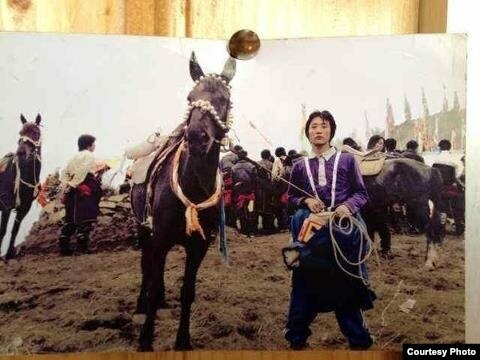 Local Tibetans have described him as “good natured and polite,” who had a keen passion for horses and horse racing. Since 2009, as many as 96 known Tibetans have set themselves on fire protesting China’s rule and demanding freedom and the return of Tibetan spiritual leader His Holiness the Dalai Lama from exile. An undated photo of Tseba. A Tibetan teenager burned himself to death Saturday in protest against Chinese rule in Gansu province in the first Tibetan self-immolation in 2013, according to sources. Identified only as Tseba, he torched himself in Achok township in the Kanlho (in Chinese, Gannan) Tibetan Autonomous Prefecture's Sangchu (Xiahe) county, the scene of numerous Tibetan demonstrations and self-immolation protests last year. “He called for the return of [the Tibetan spiritual leader] the Dalai Lama to Tibet, saying, 'May he live long, and Tibet needs freedom,'" a source in Tibet with contacts in Achok township told RFA's Tibetan service. "He died due to severe burns and the Tibetans took possession of his body and carried it to his home,” another source said. He is believed to be 19 years old. Tseba, from Keynang village, died on the spot, according to the Central Tibetan Administration (CTA), the Tibetan exile government in India's hill town Dharamsala. Local Tibetans took his body to a "safe location" first and then to his home before Chinese security forces arrived at the scene of the self-immolation, the CTA said, quoting eyewitnesses. It was the first Tibetan self-immolation protest this year, bringing to 96 the total number of burnings so far aimed at highlighting opposition to Chinese rule and seeking the return of the Dalai Lama, who fled Tibet after a failed national revolt against Chineseoccupation in 1959. “Today's events demonstrate that Tibetan rejection of the Chinese occupation is as strong as ever," said Stephanie Brigden, the director of Free Tibet, a London-based advocacy group. "The new Chinese leadership and the international community cannot allow demands for freedom to continue to go unheeded. 2013 must be the year where positive change comes to Tibet,” she said. The Dalai Lama this week called again for Beijing to conduct a “thorough investigation” into the causes of the self-immolation protests, at the same time dismissing official Chinese accusations of complicity in the burnings. Charges that he has incited the fiery protests from afar are an “indication of desperation” on the part of China’s leaders and are promoted to the Chinese by a policy of “censorship” and “distorted information,” the leader told India’s NDTV news channel in a talk show. “They really find it difficult to explain [these events] to the outside world, and also they put a lot of restriction about this information to their own people,” the Dalai Lama said. “The time has come [for them to conduct] a thorough investigation” into the protests’ causes, he said. In the latest move, the authorities have embarked on an aggressive drive to seize satellite equipment used by Tibetans to tune in to foreign radio and TV programs, according to residents and other sources. They said hundreds of satellite dishes and receivers have been seized from homes in Malho (in Chinese, Huangnan) prefecture in Qinghai province and destroyed to prevent news on self-immolation protests from spreading. The authorities are encouraging Tibetans to buy smaller satellite dishes and new receivers to replace the usually large dishes that had been confiscated. Some suspect the new equipment, which can be used to receive only state-controlled programs, are doubling up as surveillance devices, a Tibetan in Rebgong (in Chinese, Tongren) county told RFA's Tibetan Service. ​​Tibetan sources from the area say that the head of the Sangchu County Security of Kanlho Tibetan Autonomous Prefecture, Gansu Province, has forced the family of Tsering Tashi , to cremate his body immediately without traditional Tibetan religious rites and rituals having been performed. The family had to comply by cremating Tsering Tashi on the night of January 13. 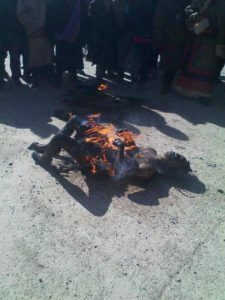 In an apparent protest against China’s repressive policies in the region, Tsering Tashi, 22, set himself on fire on Saturday, January 12, 2013 at around 2 pm in Achok Township, which is located in Sangchu County. Sources from the area told VOA that Tashi was wearing iron chains around his body when he self-immolated, and that he had shouted, “Victory to His Holiness the Dalai Lama” as he was engulfed in fire. Tashi died at the scene of his protest. Sources also stated that local Tibetans pelted the security forces with stones and were successful in securing Tsering Tashi’s body and taking it to his home yesterday. In order to avoid further repercussions, Tsering Tashi’s father, Dukar Kyab, agreed to cremate his son without having carried out proper religious rites. Tsering Tashi’s mother, Tsering Dolma, lost consciousness from the shock of having to perform the sudden cremation and had to be taken to the hospital for treatment. Tsering Tashi is the first known Tibetan to self-immolate in, bringing the total number of self-immolation protests in Tibet since 2009 to 96. Sources describe Tsering Tashi as a good natured young man who loved to ride horses and had won races in the local horse racing contests. The Dalai Lama last week called on Beijng to conduct a “thorough investigation” into the causes of self-immolations in Tibet instead of blaming outside for complicity. Almost of all of the 96 Tibetans, who staged self-immolation protests in Tibet, called for the return of the Dalai Lama to Tibet and freedom for Tibet. A Tibetan man has died after setting himself on fire in protest at China's rule of the region. The man died at about 1pm (0500 GMT) on Saturday, London-based Free Tibet said, in what is thought to be the first self-immolation since December 9. The immolation happened in Xiahe, a county in western China's Gansu province known as Sangchu in Tibetan. The body of the man, who was identified with the single name Tsebe or Tseba, was carried back to his home village about 4 kilometres away following a protest, Free Tibet said. The rights group said he was aged in his early twenties, while US-based group Radio Free Asia (RFA) said its sources claimed he was 19. The man called out for the Dalai Lama to be allowed to return to Tibet. RFA claims 96 ethnic Tibetans, many of them monks and nuns, have set themselves on fire in China since February 2009 to protest against Beijing's rule in Tibet. Free Tibet director, Stephanie Brigden, said the latest immolation demonstrates that Tibetans continue to reject Chineseoccupation. "The new Chinese leadership and the international community cannot allow demands for freedom to continue to go unheeded," Ms Brigden said. 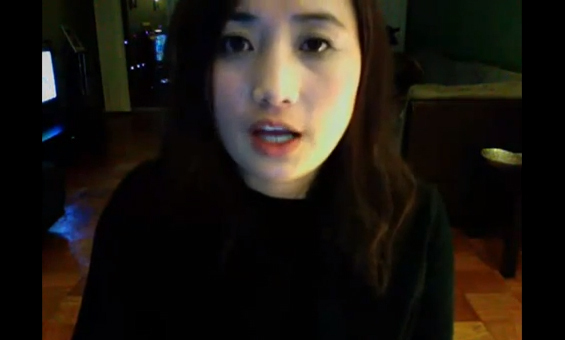 "2013 must be the year where positive change comes to Tibet."